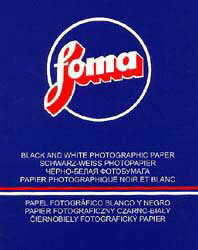 Fomalux SP 111 glossy, 25 sheets 24x30cm. A black-and-white, contact paper on a baryta paper base. One A-4 negative sleeve is fitting on this format. This new paper on Silver Chloride base has a very low sensitivity. FOMALUX 111 SP is produced in one contrast grade: special (Sp) in one surface: glossy (111).